The tubing for the wind vane, that is. On the positive side, thanks to some help from Brett, I have the windvane bolted to the transom with two out of the four mounting plates. Thinking the hard part was done, I sent Brett onto his tasks for the day, and set about mounting the second two plates. I realized that figuring out the lengths might require more math than I recall from high school based on the angles involved. The problem boiled down to not being able to mount the plates without knowing where the tubing was going to meet the transom, and not being able to figure out the tubing length because I didn’t know where the mounting plate would be located. Finally Jenn pushed me into using some plastic tubing to mock it up, and I think I have the length figured out. But… my power tool selection doesn’t seem up to the task of cutting the tubing, although I could buy a new Sawzall blade or two and try making the cuts. I’m actually leaning towards finding a machine shop on Monday and paying for a couple tubing cuts and the two holes I need drilled in it. Not complicated work with the proper tools, but a bit tricky without them. Only having a limited amount of tubing that came with the windvane, I don’t want to make a mistake. 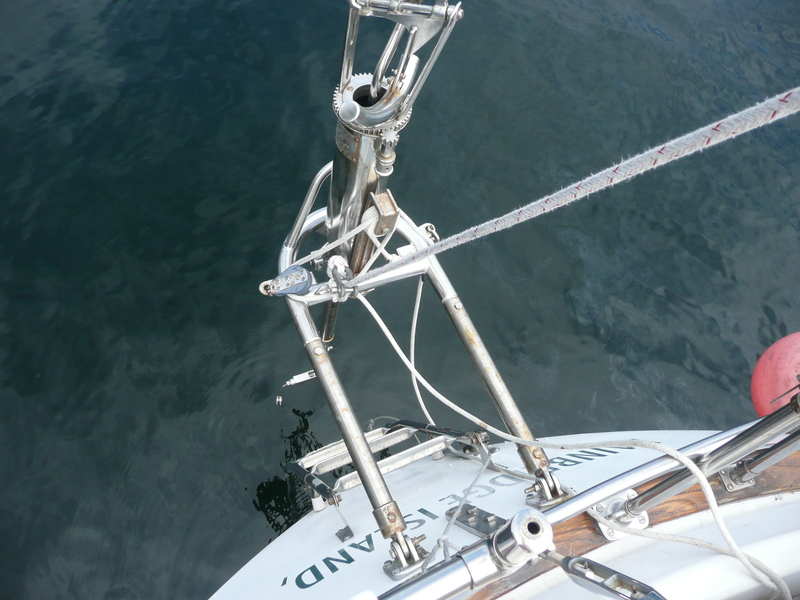 At least for the time being I have a photo of the windvane attached with the first two tubes and plates, and being held up for support by the main halyard which worked out well for holding it in place and leveling it out. In other news, the jib is down in preparation for new standing rigging, the new teak on the bow is really starting to look great after multiple coats of teak oil Jenn has applied, and also thanks to Jenn the Rodeo is shiny clean and ready to be posted on Craigslist. Anyone looking for an inexpensive 4wd SUV? I’m also looking forward to putting the engine back together (the one in the boat, not the Rodeo. It runs like a champ), but I need a part that I have to wait until Monday to obtain. Isn’t it kind of odd that places that sell engine parts are closed on weekends? Isn’t that when most people have time to work on their engines? Look for a post about my engine work coming soon.